The colors for the Color Throwdown Challenge 146 are not what I normally work with. Therein lies the challenge for this stamper! The layout is from the Splitcoast Sketch Challenge 337. The cardbase is a standard A2 in Lucky Limeade, followed by a layer of Tangerine Tango, followed by a layer of Greenhouse Gala designer paper that’s been doctored up. I used some Martha Stewart Carnelian glitter to add bling to all the “orange” areas of the pattern. 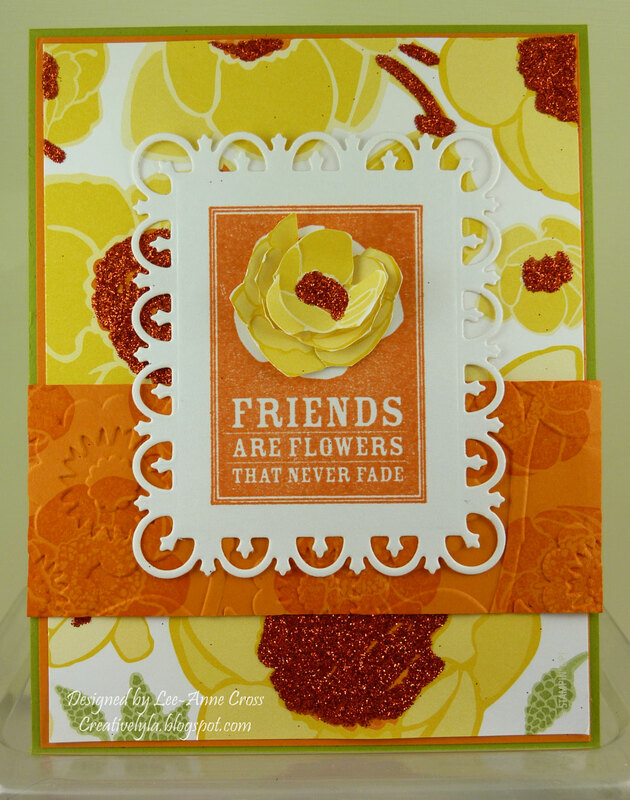 Next came a strip of Tangerine Tango that’s been stamped with the floral image and then dry embossed. The focal point is stamped on a nestie die cut. I cut several layers of the flower out of the same designer paper and did a little bit of paper tole, then added some of the same glitter to the center of the flower. Well that’s it for today; have a wonderful Wednesday everyone! For being out of your comfort zone, you really rocked these colors! And I love the FdL die cut!! Thanks for joining us this week for the Color Throwdown! Wow! Very vibrant and cheerful! Love your layered flower too!